Looks like I’ve done it again. My friend and now co-worker Jeff Barnes has gotten the Podcast Fever. ( http://jeffbarnes.net/portal/blogs/jeff_barnes/archive/2007/07/31/podcast-fever.aspx ). He’s blogged about his new Zune and how he’s finally using it for educational purposes. Jeff offers a great list for the .Net developer and beginning podcast listener to review. Be sure to check his list out. Oh, and Jeff, don’t worry, there’s currently no known cure for Podcast Fever! It’s been a while since I talked about Visual Studio add-ins, so when I ran across KNOCKS Solutions “Knocks VS2005 Add-In”, I knew I’d found the perfect subject. Available at http://www.knocks-solutions.com/VS2005Addins.aspx?sm=idVS20052 , this rather full featured add-in offers many utilities. First is a personal clipboard, that allows you to store and retrieve up to 9 different items. And they’re persistent, they will stay between VS sessions. Next is a code snippets manager. This seems a bit redundant in light of VS 2005’s snippets, but I can see it being very useful during a presentation. In addition to the code snippets is a Notes module. I’ve often wished for the ability to store quick notes to use in a presentation, so this is a handy module. Up next is the one tool of theirs I have a beef with, the “Re-arrange code” tool. I like the idea of being able to re-arrange my code. Often I’m working on some public method, and realize I need a private helper method and, being in a hurry and lazy, will drop it right under the public method. Later I’ll move it around, which was why I was excited to see this tool. Sadly, it has a really bad side affect, it strips out any regions you’ve put into your code, and it strips out any comments that might lie between methods (I often put a comment header right above my method, instead of in the method.) When Knocks rearranges your code all of that goes into the bit bucket, making the tool useless in all but (perhaps) the very earliest stages of coding. I would have thought it possible to add regions to the tool as well, and allow code rearranging within a region, between regions, or even to move regions around. Perhaps this will be addressed in the next version (he said, ever full of eternal hope). There is a nifty zip tool that will zip your entire project, handy for quick backups. Also is a tool that embraces the concept of a favorites for projects. Another tool is one I wonder why no one did sooner, a keyword search on Google (or other configurable search engine, like MS Live). This is one I’ll be using often. Also included is a simple “Data Object” generator. 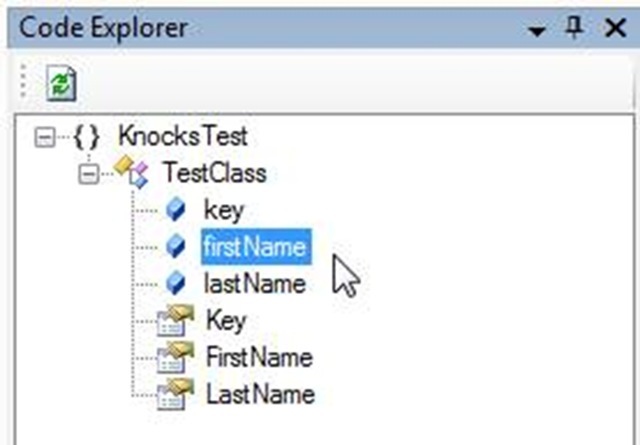 You bring it up and enter a few property names and types and Knocks will create the basic class for you. While I have seen more full featured code generators, I appreciate the basic simplicity of this one, not to mention the price (which I’ll get to shortly). The final two tools I’ll mention are my favorites. First is a Design Explorer. This adds an explorer window (I put mine with the Solution Explorer area) to your display. In it are all the controls for your current form. 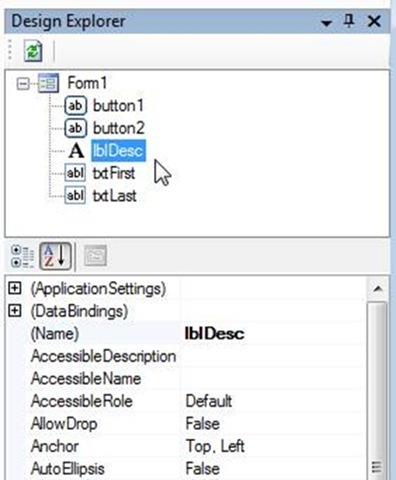 Clicking on the control not only makes it the active control in the designer, but displays the properties in the lower half of the Design Explorer window. The other tool is the Code Explorer. It displays a tree of your current code module. Double clicking on the code element will take you to it in the code window. I’ve seen other add-ins with code windows, this one seems equal in functionality with many others similarly priced. Oh, did I forget to mention the price? It’s free. Yes, FREE. Knocks has packed a lot of functionality into this add-in, and the fact it’s free makes it well worth the time to download and learn. Over time I’ve read quite a few helpful hints and tips on how to “tame” your e-mail. I have a few I’ve developed over time that I haven’t seen mentioned before, so I thought I’d share. First, I deal with a lot of different projects at once. One thing I find valuable is to include the name of the project the e-mail is about in the subject line. That helps me later, to quickly categorize my mails. At the very least, make sure to include the project name somewhere in the body of the mail. Nothing’s more confusing then getting cc’d on an e-mail that says “I took care of the files” and not knowing what project the person refers to. Next comes archiving of your e-mails. Many texts I’ve read tell you to read the e-mail, take action on it, then get it out of your inbox. But what do you do with it when you’re done for the time, but you may want to save it to refer back to later? I’ve found the best method is to create individual Outlook data files (.pst) files for each project. True, you will wind up with a lot of pst files, but you can easily close them once the project is complete and get them out of your way. You can even burn them to a CD or DVD when you need more disk space yet still be able to open them. You still have the luxury of creating individual folders within the projects pst file, if you need to subdivide more; perhaps meeting minutes, agendas, coding, and testing might be folders you want. At one time I just had one projects folder with folders and subfolders galore. The problem was it quickly became cluttered from past projects, and kept growing in size. I found moving each project to its own data file to be much easier to manage. OK, I hear you asking “What about those e-mails not associated with projects?” Maybe it’s a policy notice, or a confirmation about a software purchase, or just some “congrats you did a good job” e-mail you’d like to hang on to. For those I create an Outlook data file for each year. I then have 12 folders, one for each month. I am very strict with myself about what goes in here, to keep it from becoming a miscellaneous junk bin. I typically have no more than 20 or 25 messages for any given month worthy of hanging on to. OK, we’ve all been victims of this next situation. We go off to a two hour meeting, come back, and find thirty seconds after we walked away someone sent out an e-mail and copied the entire department. Half the folks chose to respond, then the other half replied to the response, and before you know it there’s 42 unread mails on the one subject alone, not to mention all the other mail that’s come in. How do you quickly isolate those e-mails for a given project and deal with them? In either case, simply type in what you want, like the name of your project (remember my first tip?) and hit enter, or click the word Search (2003) or the magnifying glass (2007). The area where your inbox sits will now show only the messages with your search word in either the subject or the message body. Once you have filtered your box to show only those messages you want, it becomes an easy matter to move them to archive, delete them, or deal with them in some other manner. 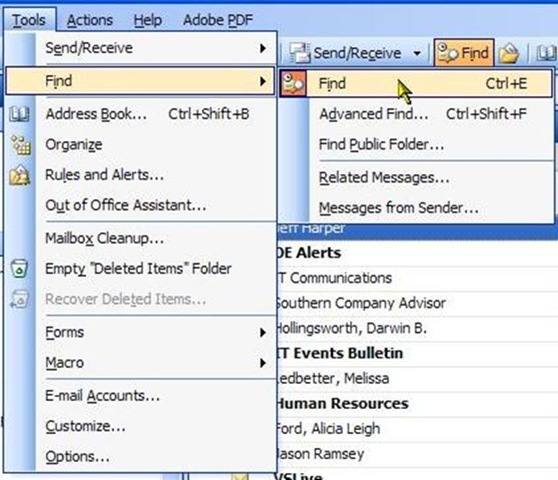 When done, simply click Clear (2003) or the X (it pops up where the magnifying glass is in 2007) and your inbox will be returned to it’s non-filtered state, hopefully with a few less messages for you to deal with. OK, so you have a piece of mail that you want to keep in your inbox for a few days, you don’t want to file it quite yet, but don’t have to handle it right this second. Most common for me are announcements that a database or system will be offline for maintenance. I certainly want to know about it, and be reminded, but don’t need to do anything right now. For this I use the flags. The very right most column of your inbox depicts a small flag. Clicking on it will turn the flag to a red color. In 2003, you can pick different colors, in 2007 the color is tied to the distance in the future the event will occur. In either version, one of the menu options is “Add Reminder”. 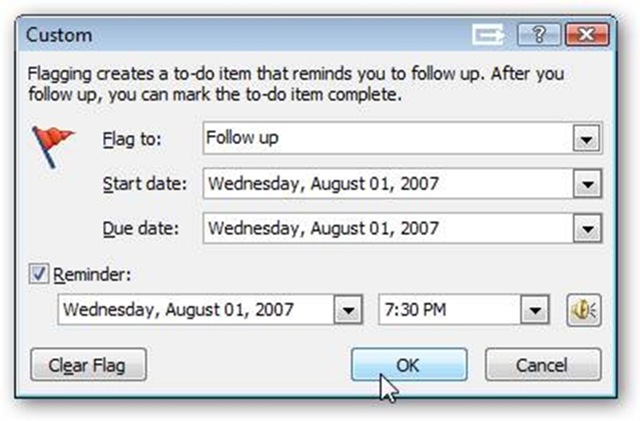 With it, a dialog pops up to let you give a calendar date / time when you need to take action. In this example, the e-mail was letting me know of a live radio interview being done with a member of one of my favorite bands, Midnight Syndicate (http://www.midnightsyndicate.com). I’m adding a reminder to that e-mail so I’ll be sure not to miss it. I’ll then basically ignore the message, letting it sit in my inbox until the time comes for me to deal with it. Once the event is complete, be it a database outage, meeting, or special event, I can click again on the flag, to “Mark as complete”. I can choose to archive the message, respond to it, or delete it. Speaking of deleting, the final piece of advice I can offer is delete, delete, delete. Let’s face it, how many of those messages do you really need? If you are the recipient of a long chain of e-mails, just keep the last one and delete the rest, their contents duplicated in the last one. Meeting announcements, bake sales, grocery lists from the spouse, are all things which hit the bit bucket as soon as I’m done with them. I’d bet if you’re like me, a good percentage of your e-mail can safely be deleted. Using these techniques, I’m able to keep my inbox to between 100 and 150 messages, a manageable level. A fry cry from the old days where I might have 2,500 messages in my inbox! I’m always trying to improve, though, so if you have ideas for taming your inbox please post a comment and share with the community. This fun little romp from 1984 has a large collection of now well known stars such as John Lithgow, Peter Weller, Christopher Lloyd, and Jeff Goldblum. The hero, Buckaroo Banzai is a brain surgeon, particle physicist, and rock star. His experiments in the eighth dimension land earth right in the middle of an interplanetary war, and that’s just the first few minutes of the movie. Standard disclaimer: I don’t make any money or have any financial affiliation with this flick or anyone who sells it. Just a cool movie. So there, monkey boy! Since the facts in your fact tables mark discrete events in time, you would expect them to change pretty often. Your dimensions, on the other hand, tend to be pretty stable. An Employee dimension, for example, wouldn’t change very often. But, it will change. Employees move, get married, croak, or quit. To handle these changes, data warehouses have adopted the concept of slowly changing dimensions. They are categorized into three types. Type 1 is the basic type, with it previous versions of the dimension are overwritten with the latest data. Changes are not tracked. This can be OK, based on what the business will be doing with the data. Take the example of an Employee dimension. Our star employee, Hortence McGillicutty moves, and updates her address. With the warehouse, the only business task done with the address is mailings. In this case, we don’t care what her address was two years ago, we only need her current address for mailing her paycheck and other related data. In this case, loosing the history of her previous address is fine, so a Type 1 dimension is a good choice. Let’s say, however, that the business uses the Employee dimension much more extensively. Perhaps we have an application that on the left side of the screen displays information pertaining to the most recent financial statements. On the right is a scanned in image where our star Hortence McGillicutty has signed off on these statements. A few months go by, and our heroine falls in love and gets married. If we were still using a Type 1, the scanned in image still has her maiden name, but the display to the left now shows her new married name, Hortence Hollywogger. Not a big deal you say? How about the first time a Sarbanes-Oxley auditor comes in, finds the discrepancy, and threatens big fines. The warehouse could then look up the correct name based on the date. In the case of our above example, the system would look up based on the date the report was signed, discover it was during the 07/17/2001-06/15/2007 time frame, and display her name correctly, leaving our auditor looking elsewhere for imperfections. I mentioned there was a third type, which predicibly is named Type 3. With type 3, you don’t add new rows, but new columns to the table to handle changes. As you might guess, this can become quite a maintenance nightmare, and is rarely if ever used. Like Microsoft Bob ( http://en.wikipedia.org/wiki/Microsoft_bob ), Type 3 is probably best forgotten about. To summarize, use Type 1 when tracking changes to the data is not necessary. Use Type 2 when you need to know when those changes were made. How do you decide? That’s where your customers become involved. It will be necessary to know what they plan to do with that information. Yes, I know, talking to customers can be a scary experience, but hey just envision them using Microsoft Bob and you’ll be OK.